Displays are screens showing numbers, text, or graphic data. They use LED, LCD or OLED technology. Industrial uses include the presentation of measurements, transmission of instructions (human-machine interface) and in vehicles. Visual communication in public and commercial areas is ensured by large displays. LED displays show alphanumeric characters, symbols or information in the form of a graph. Numeric capability depends on the number of digits the unit can exhibit. 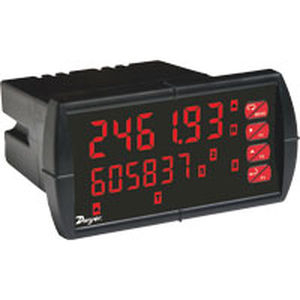 Process-control displays are often also measurement transmitters. They feature multiple inlets for current, voltage, resistive sensors and thermocouple measuring. Programmable alarm thresholds activate dry contact outlets or open collector outputs. Such displays are powered by an electrical network or by a four-20 mA current loop. They can be equipped with a network interface. The display can be built into the front of a device, mounted on a DIN rail, or screwed to a hard surface. LCD and OLED displays use dot or pixel matrices, and have comparatively greater text and image displaying abilities. Very large displays may have scrolling data capability. Consider the display's size, number of characters, pixel count, communication ports and buses, and back-lighting possibilities.